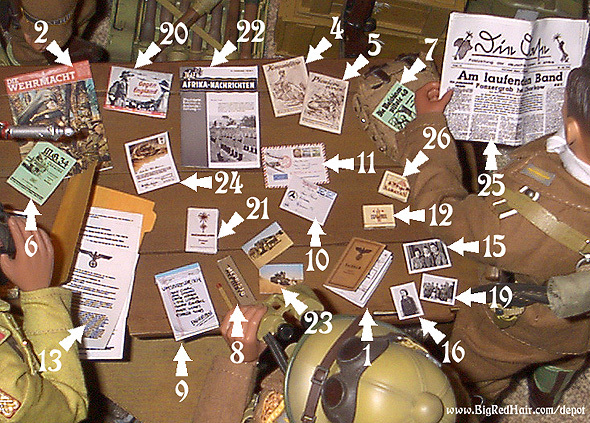 1/6 Scale World War Two Papers and Personal Effects. A German soldier’s I.D./paybook. It is an 8- PAGE OPENABLE booklet, with photo and service records. The monthly magazine for the infantry. This is a late-war color version. A steno book used to write about combat actions. A steno book used by combat engineers. A manual for the MP 34 machine gun. 7 - DIE MASCHINEN PITOLE 40. A manual for the MP 40 machine gun. A pencil case. Sorry this item is discontinued. A notepad. Sorry this item is discontinued. An letter with appropriate postage, cancellation marks, etc. An airmail letter with appropriate postage, cancellation marks, etc. A pack of Turkish cigarettes. A manila envelope with tab, containing Reich documents and orders. Photo of soldier's family, with personal messages written on the back by wife and daughter. Snapshot of soldier’s sister (or girlfrend), who herself is in a military tunic with merit badge. Snapshot of soldier’s DAK unit, posing with an African boy. 20 - GEGEN ENGLAND IN NORDAFRIKA. A military-issue book on the history of the war with England in North Africa. A calendar book in which a soldier could jot down brief entries from day to day. 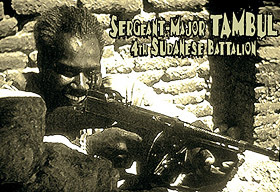 Report from Africa, a weekly magazine for DAK soldiers. both in desert settings with natives. Writing and addresses on reverse side. A letter of commendation with a color graphic of a DAK truck barreling through the sands. This was issued to those who had excellent driving records, and was signed by Fieldmarshal Rommel. The Oasis, the official German newspaper for troops stationed in Africa. A mini work of art--my personal favorite (next to the soldbuchs). German/African cigarettes. You'll strain your eyes admiring the graphics on these packs! The cigarette packs do not open, but they are not simply folded paper boxes--they've been affixed to small pieces of wood to give them volume and durability. They’re not easily crushed! And have I mentioned how great the Karavans look? The Soldbuch opens up, but the other booklets and magazine pages are glued together. Owners are encouraged to dog-ear the corners a little, even bend them a bit, for that used look. The cost of these sets are the result of them being produced by hand, after extensive research, and I hope any hard-core WWII buff would agree that it’s worth it. The accuracy and detail found in this assortment simply cannot be emphasized enough! 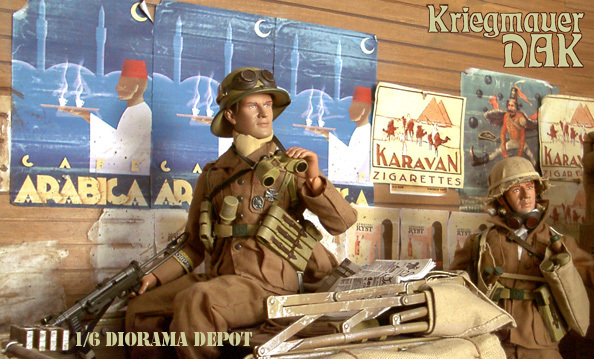 Custom made Afrika Korp backdrops for dioramas. 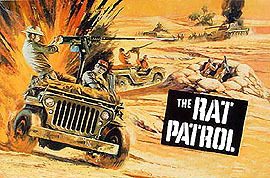 Check out my tribute pages to SAHARA and THE RAT PATROL.